With the incredible success of TV's World Poker Tour, Texas Hold'Em has become one of the most popular games in casino card rooms. Now you can master the game with the World Poker Tour Official Rules Book, featuring a chapter on Texas Hold'Em rules, hints, and tips. 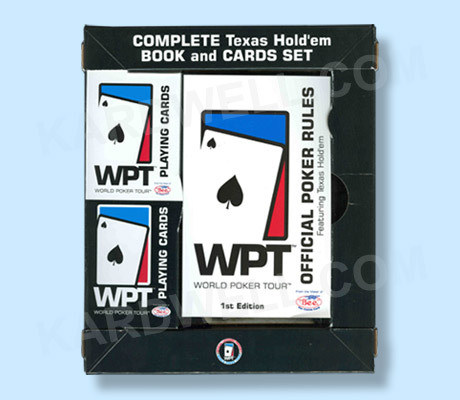 Each World Poker Tour Set includes the World Poker Tour Official Rules Book and 2 decks of WPT Bee Playing Cards. The handy 134-page book will teach you the rules of more than 100 Draw, Stud, High-Low, and Common Card Poker Games including: Texas Hold'Em, Five-Card Stud, Lowball, Omaha, and many others. And, since WPT Decks feature the unmatched snap, shuffle and slide of Bee Playing Cards, you will play with the same quality cards used by leading casinos such as the Bellagio, MGM Grand, and Borgata. For additional information or wholesale pricing on World Poker Tour Book and Card Sets, please contact us at 1-800-233-0828. Sale Price: $9.38. Was $16.50. Save 43%!